What can be better than interviewing young and promising actors who did an unimaginable job despite limited funding, if we can call it that way, yet go on stage and deliver the best performance they could to tell an intimate and compelling story? The play VIGILS by Noah Haidle might be over, but the impression you get from it will certainly stay much longer. 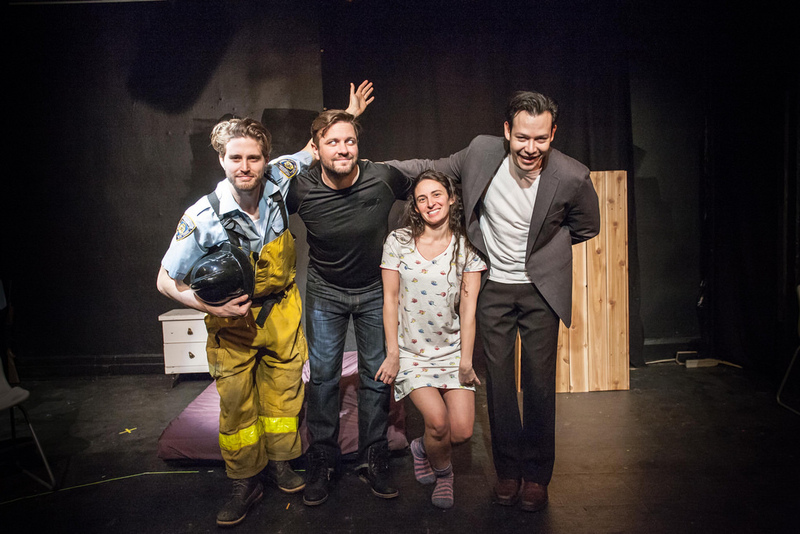 The cast of VIGILS, Tyler Smith, Alex Cruz, Kathryn Aboya and Trevor Ketcheson kindly agreed to talk to “Let the Movie Move Us” to discuss the play and its main ideas that inspired them conquer the little and humble stage of Redsand Castle Theatre in Toronto. MOVIEMOVESME: I assume, you all had your own reasons to be a part of this play. I am sure the readers would love to learn that. Alex Cruz: When I first read this play I fell in love with the emotional roller coaster. I could really identify with the conflict each character was experiencing throughout, especially that of the Wooer whom’s determination to find true love I admired. He is a character who has not been jaded by the heart break and losses associated with finding and losing love. Completely unaware of the potential heartache and pain that could come with falling in love and loving another person the Wooer teaches us to love fully without any pre-conceptions. Tyler Smith: In all honesty i wasn’t going to do this play..(laughs) I have always been a little afraid of theatre stemming from my own insecurities and pressures of live performance. Kathy approached me with the idea of the play and i initially said no. She then asked me to Read the play, which i did and couldn’t get through it without crying. i tried again and cried again.. it really spoke to me and i connected with it instantly. When asked ‘if you could play any role, which character would you pick?’ i responded with SOUL!! DEFINITELY SOUL… and the rest took care of itself. i have made many changes in my life recently that encourage me to step outside of my comfort zone and grow as a person… Live theatre certainly fell into that category. Kathryn Aboya: I was looking for a monologue in Theatre Books (back when it was still around) and I saw an excerpt from the play which started with “It’s been two years since you died”. I read it and thought it would be great to see the play in its full form. Like all great things, a copy was not available in store so I had it ordered in from DPS. A week or so later it arrived and I took it to Trinity Bellwoods Park along with my shopping to read it on a nice summer day. I bawled and laughed for 1.5 hours straight. I had to mop up my face with the package of J-cloths I had bought since I had no tissues. I went home that night and read it again, with the same reaction, and caught a cold from all the crying. I knew at that point I had to produce this play and give life to the Widow. It touched upon so many layers of grief and was so candid. I knew that audiences would react to it the same way I did, since it’s such a hard-hitting subject. It was very important for me to tell this unique story and I was intent on dealing with my own grief in the process. Trevor Ketcheson: I was asked by the Director; Brian Kennington, to play the part of the Body. Upon reading the script I knew the play would be an inspiring piece and something that I could be proud to be apart of. MOVIEMOVESME: Kathryn, this is your first play ever. What had motivated you to wake one day and just do it? Kathryn Aboya: As I said I was sitting on it for 2 years, trying to figure out how to incorporate aerials (which was the playwright’s direction) but in the end, it was too costly for my first production. I met with a friend of a friend, who is now our director, Brian Kennington. He said not to worry about the aerials, to just get it up. He said this run was almost like a dress rehearsal. I said let’s go for it, so he got on board and brought Jim Tooby, the Stage Manager along for the ride. We worked backwards based on Brian’s availability, and the space that was available. Jim luckily booked time off to participate, even though he’s working on the Marvel slate of films at the moment. Both of them fell in love with the play and wanted to be a part of it instantly. MOVIEMOVESME: How did you prepare yourself for the role? Tyler Smith: Like any role I take on, I try to ‘feel’ out the story before focusing on my character. i like to be able to understand the story and its intent before applying my part. The way in which this project came to me allowed this to happen because Kathryn sent me the play before i knew which part i was. so i totally understood what ‘Soul’ was all about. It was then up to me to establish his conflict. Was it being trapped that was his motivation? was it torture of his love for the Widow and witnessing her dating someone else? there were many complexities to the character and it was a great pleasure to play. Alex Cruz: For the role of the Wooer I went back and reviewed many books written by Paulo Coelho such as “11 Minutes” and Don Miguel Ruiz Jr’s “The Four Agreements. These are books that touch on the subject matter of loving unconditionally and without fear, having experienced many losses in my personal life, it was very important for me to go back and review the way in which true love manifest’s itself before we are jaded by such losses. In addition, I spent many hours people watching in cafes and restaurants around the city paying special attention to couples on their first dates. This was very insightful in developing the sense of nervousness we all experience on a first date. It’s amazing to note the body language and demeanour of nervous Wooers many of which have no idea what to do with their hands, or how to stand in some instances, and often saying things that are at best ridiculous. Kathryn Aboya: There’s a lot of research involved for this character. She’s dealing with being a widow, previously miscarried, now infertile, attempted suicide, and deceased parents. I had some real life experience since my mom passed when I was 16, which was what drew me to the play in the first place. The idea of putting her soul in a box would have been a very appealing idea at the time. I don’t know anyone who would pass up on that offer, because grief is so intense that you will do anything to avoid living in it. So I did some research into being a widow, having a miscarriage, infertility, suicide. Each subject deals with a different layer which colours the scenes. For example, being infertile would change the way that you behave in the opening scene. When the Wooer asks ‘Did you ever think of having children’ and I blurt out that I’ve had a miscarriage, you immediately want to take it back. You don’t want the man that you’re trying to start a relationship with to find out that you’re holding this secret. What if he considers you less of a woman? Or decides not to see you because you can’t bear children? There’s a lot at stake and she’s dealing with so many emotions and pain, that you are rooting for her all the way through. Being a widow, you always wake up thinking they’ll be by your side. And the thought of being with someone else provides a lot of guilt. Suicide is usually a cry for help, and more women than man attempt it but the rates of success are much higher among men. Miscarriages leave you wondering if you’ll miscarry again, and most women already know something is wrong with the fetus and try to hide it from their partners until they have proof from a doctor that it really is no longer a living baby. So it has been an intense journey but I fall in love with her more and more each day. Trevor Ketcheson: In preparing for the role I approached it the same way for any role; learning lines in rehearsal and script analysis on my own time. One thing in particular that helped me get into the mind set of a firefighter was a phone call with a colleague of Kathryn`s, a Hamilton firefighter named Ralph, who let us pick his brain about the daily schedule, relationships and times of emergency. This was a crucial element in achieving authenticity in the role. MOVIEMOVESME: What is it that you loved most about the play and the characters you portrayed? Kathryn Aboya: I loved the Widow because she was trying so hard to move on but nothing is working in her favour. No matter how hard she tries, something trips her up. I loved her courage. The playwright is a genius. He makes you fall in love with each and every character because his writing is so truthful and that’s what makes it so raw. Tyler Smith: it is apparent that this play speaks to everyone in some way. I think at some point we have been every character in one way or another in our normal lives and you go on the journey with each character. Alex Cruz: What I love most about the play is the momentum it gains from start to finish, I found myself comparing it to a train chugging faster and faster down railroad tracks only to come to a swift stop at the end. The ending leaves so much to the imagination and leaves the audience begging for answers while providing an emotional and deeply touching experience that anyone who has ever lost love whether a lover, family member or friend, with a sense of catharsis. Trevor Ketcheson: I enjoy my characters’ curse of living out its memories, good and bad, and the sudden shift between them. It reminds how quickly our own memory can shift. Also, that we can’t choose to unremember certain parts of our life. My character struggles with the purgatory of reliving uncontrolled memories and that was a great challenge for me in the role. MOVIEMOVESME: Red Sandcastle Theatre is small and a little cozy. Whose idea was to premiere the play there? Kathryn Aboya: The director has used the theatre before and suggested it. I went to see a pantomime there at Christmas time and thought ‘this could work’. It was much smaller and simpler than I had envisioned, but it has turned out to be just right for this run. It’s cozy and intimate, only 60 seats. The audiences have told us that we make the stage seem much bigger than it is, and it feels that they are watching a film. Some even feel guilty to laugh because they are so close to us and feel our pain. It’s important for us to play the truth of the play, because once that’s in place all of the rest takes care of itself. You have to remember that there is no audience, so you can actually give the audience the most believable experience. MOVIEMOVESME: Could you share your experience sharing the same stage as well as the beauty of acting on the stage? Tyler Smith: being a film and Tv actor had me worried, i am not trained in theatre and don’t know too many ‘tricks of the trade’ this was evident when I started to lose my voice after just two shows lol. But working with Trevor and utilizing his experience as a theatre actor really helped me relax into it. Alex brought this like-ability and natural innocence to his work and that was great to watch because it allowed me to bounce off and respond in certain ways. Its really great to have such a contrast of performance and allows me to explore myself a little more and then there is Kathryn who is such a powerhouse and her work ethic and attention to detail really made me realize i need to take it a little more seriously. The three energies combined pushed something out of me that i wasn’t completely sure i had. Its really been a beautiful experience for me from both a professional level, but more personally i have found a family in this cast and we will be forever connected. Alex Cruz: My experience of sharing the same stage with Kathryn, Tyler and, Trevor was one of my fondest memories I hold as an actor. These guys truly just ooze with talent, always prepared, friendly, welcoming and ready to work hard. Their level of professionalism, skill and genuine love for the craft really helped to create an environment suitable for conveying the really raw emotions found within the play, allowing us to take the audience on the emotional ride with us every show. The whole team including our director Brian and stage manager Jim were incredible human beings. As for the beauty of acting on the stage, I think the beauty of stage work is that you don’t get another chance to do another take, each moment has to lend itself to the story and it is such an electrifying experience in front of a live audience. Kathryn Aboya: This was my first time ever on stage, so I didn’t know what to expect. I had volunteered on a remount of ‘One Flew Over the Cuckoo’s Nest’ in Melbourne when I was training there so I got a feel for what the whole thing was really about. They let me say at the beginning of their first show ‘Welcome everyone to opening night and I hope you enjoy the show’. I was so nervous I barely got it out. So this was interesting, to just get up and do a play. Both the Wooer and the Soul are first timers too, so we’ve worked with our voice levels and finding the light, playing to the audience, etc. But it has been an incredible experience. The director is infinitely patient and supportive, so it’s very conducive to finding your way. Nothing was ever a big deal, he made us all feel very comfortable. He’s an actor himself so he understands the importance of letting the actors find the characters. We did a table read then rehearsals 6 times per week for 3 weeks, and he let us work on the emotions first then get the audio levels up for our Bump-in to the theatre. Sharing the stage with these 3 gents has been a wonderful experience. We’re a close-knit family now and they are so supportive. They have all helped in their own way to produce this play, knowing that I’m doing it on my own and can use all the help I can get. So we have a few laughs in the wings – Tyler’s contacts keep falling out, I have so many wardrobe changes and they all help me into my gear so I don’t miss a beat. It was really interesting that the last show we had, our tech crashed. So we had to pretend to hear a baby crying, roof collapsing, alarm clock ringing, etc. I was mortified when I went out on stage and realized that we had nothing – we weren’t told, as it just happened real time. So Trevor (who is the only one with formal theatre experience) just coached me on and said to be in it as best you can and engage with everyone as much as possible. It turned out to be our best run yet, and was a huge learning experience. The beauty of acting on stage is that you can connect with your audiences real time. You also make discoveries as you go along with each and every show. We are finding that the people who come to watch are so moved by the play that we all end up coming out and hugging afterwards – there’s a strong theme of hugging in the play. Speaking with our audiences after the show gives me a lot of insight into the characters and what’s working. Everyone is touched by something different. For example, one of my cousins can’t have children and had to adopt, so I could feel her crying in the audience when I went over ‘something happened with my eggs and my tubes’. Another cousin of mine had her first child at 15, and got pregnant in the back seat of her car, just like the character. One gentleman told me after a performance that he was most moved by the scene where I can’t get rid of any clothing, because he lost his mother 30 years ago and still can’t throw her clothes away. So people connect to different parts and that’s the beauty of acting on the stage – hearing what touched your audience. It feels very much like a therapy session. Trevor Ketcheson: Performing in our venue; the red sandcastle, provides its unique difficulties in its wide audience; spanning an unusual stretch which requires actors to play more openly to the house. However, it is also intimate which allows an actor to tone down ones performance and create more subtle interactions. Thusly this stage allows for great duality in playing open on a stage but allowing for fine moments to be observed. And that is my most coveted love for the stage – portraying interactions and characters that seem real to the audience, perhaps reminds them of someone that they know, and amusing an audience; distracting them from their own thoughts. MOVIEMOESME: There are many actors who probably afraid of live performance. What would you like to suggest them? Kathryn Aboya: Go for it. I had nightmares every day throughout this entire process. How am I going to pay for the play? Will anyone hear me on stage? Will I be any good? Since I am producing and acting at the same time, I’ve had half the time I would normally invest into researching a character. So I felt really under prepared. But I think the acting Gods throw you a bone if you put the work in and your heart is in the right place. I always ask my characters ‘What would you say/do if you were still alive’? That generally helps me drop in. So I would say follow your dreams, do everything that scares you, and go for what you want. There is no acting experience more thrilling than live theatre. Every actor should do it. I will endeavor to do at least a play per year now. It fuels your soul. Tyler Smith: DO IT.. like myself i had to step outside of my comfort. but it is only then do you learn what you’re really about. you need to fight your fears around it. There is a quote in the movie fight club, ‘what do you know about yourself if you have never been in a fight’? and I think this applies mentally too. Alex Cruz: The advice I would give to actors afraid of live performance is that, regardless of whether you are performing in a school, at an Indie play or Broadway there will always be some level of fear or nerves of performing in front of a live audience. The trick really is to make sure that you leave it all behind once you step on the stage and focus on what you as the character is trying to achieve scene by scene, at this point the performance becomes a real scenario to you and the fear disappears. MOVIEMOVESME: The story of “Vigils” is about inability to let the loved one go. It is also about the Ghost that was locked in the box by his wife. I wonder, what is it that you have learned from it that you would love to share with the readers? Kathryn Aboya: Be happy. Have fun. Love life. Be generous and grateful. You really don’t know what will happen tomorrow so don’t live with fear or regret. And try to be a witness to your emotions, rather than actively engaging in the drama. The Widow has trapped her dead husband’s soul in a box but she is also doing the same to herself. She is living in a dream world filled with memories only. It’s no way to live, and I have done the same myself so I know. I feel a major shift coming for me after I’m done playing this character. That’s the beauty of good writing – each character makes you less judgmental, and more loving of yourself and the world in general and catapults you to the next stage in your life. Tyler Smith: This experience and the play itself has really taught me that some of the heaviest weights we carry don’t actually need to be carried at all. The past holds many testing and torturing things… The Future can be scary and unexpected ‘at first I was scared of what’s to come’ is even a line from the play… the only thing we have control over and the only thing that can set us free, is how we deal with the Present and making the most of what precious time we have here. Alex Cruz: What I really learned from the play particularly from my character the Wooer and the character of Captain O’Reilly, is that we should never give up on love no matter what our sad past would have us believe and, that the heart is strong enough to take on heartbreak after heartbreak “I shouldn’t even say break I should say sprain.”-Captain O’Reilly. As for the Soul and the Widow I think there is a valuable lesson to be learned about the importance of seeking help and finding support from others in times of need. The play also sends out a message about the importance of taking the time to grieve your loss and then learning to let go to move forward in search of love, because it would seem that humans need love just as a plants need the Sun. Trevor Ketcheson: A play will continue to teach for as long as you run it, and we have the gracious ability to continue this piece and receive and give something new to it. That being said, so far I have learned about grief, and that a balanced approach of sorrow and humour can be beneficial to a recovery, and that we need cherish our present moments, for we do not know what we take with us in memory. But above all else, I have a grown appreciation for the men and women who fight our fires. On a daily basis, willing to put themselves into risk for another human being or animal, and doing so with utmost bravery and comradery. My thanks to them. MOVIEMOVESME: Will you change anything for the remount process? Kathryn Aboya: Funnily enough it has been two years since I’ve had the play, and though I’ve played the Widow for a month or so now I have lived with the other characters since the first day I read it. At the wrap party, we all ended up on the balcony together at one point. We discussed the things that have been working for us and what could be swapped out. So we are doing another table read before next week and are going to go back to the essence of the play and see if we can make it as close to how Noah Haidle intended it as possible. But given the feedback and my own critiques based on our first run, I feel very proud of what we’ve delivered and I hope the playwright would be impressed and touched with what we’ve created with such a minimalist set. TIFF 2018 Interview: Emerald MacDonald and Paul Nutarariaq Talk "The Grizzlies"
My name is Ulkar Alakbarova. A wonderful name, is it not? I come from the exotic land of Azerbaijan but now I live in the hub of Hollywood North – Toronto, Canada. How lucky I am to be able to enjoy and indulge in my favourite avocation of watching movies. Movies of every genre are screened here in Toronto. There are black and white classics, avant garde, independently produced, and of course, newly released movies for all to enjoy. Let me share this treasure of entertainment with you. Read my thoughts and opinions then let me know if you agree.